Clarify, moisturize, cleanse, tone, re-plump, or smooth. Every Man’s hair is different so make sure you get what’s right for you! With the wide variety of shampoo products at West Coast Beauty there is sure to be one to match your unique needs. Fix Men Bulk Up Daily Thickening ShampooA great daily thickening shampoo for thinning hair or extra volume!Size: 300 mlHair Type & Condition: For thinning hair or hair that needs more volume.Features & Benefits: Adds volume to thinning hairUsage Instructions: Apply to wet hair Lather Rinse thoroughly Repeat if necessary or desired.. 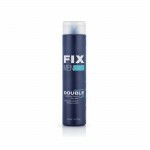 Fix Men Double Up Conditioning Shampoo + Body WashA daily conditioning shampoo and body wash specially engineered for men.Size: 300 ml & 1 LFeatures & Benefits: Formulated with the exclusive MVP complexUsage Instructions: Apply to wet hair and body Lather Rinse thoroughly Repeat if necessary or desired..
L'Oréal Professionnel Homme Fiberboost Densifying ShampooL'Oréal Professionnel Homme Fiberboost Densifying Shampoo for Thin Hair is kind to the scalp and suitable for daily use.Size: 250 mlHair Type & Condition: For thinning hairFeatures & Benefits: Helps nourish the roots and restore vitality Gives the feeling of renewed density to thinning hair Usage Instructions: Massage into wet hair, creat..
L'Oréal Professionnel Homme Tonique Revitalising ShampooRevitalises and adds brilliance to normal hair. Tailored for everyday use. Also suitable for colour-treated hair. Size: 250 mlHair Type & Condition: For all hair typesFeatures & Benefits: Helps protect against damage caused by everyday external aggressors, Using anti-free radical agents and cocoa bean extract to add extra brillianceUsage I..
Reuzel Daily ShampooA concentrated shampoo infused with Reuzel Tonic Blend of Witch Hazel, Nettle Leaf, Rosemary, and Horsetail Root is ideal for all hair types and frequent use. Helps provide effective hair cleansing and moisturizing benefits, while cooling and stimulating the scalp. An invigorating, hardworking treatment for hardworking men.Size: 100 ml, 350 ml & 1 LHair Type & Condition: For al..
Reuzel Scrub ShampooReuzel Scrub Shampoo for men has a unique combination of cleansing and scrubbing agent. With Reuzel Tonic Blend of Witch Hazel, Nettle Leaf, Rosemary and Horsetail Root provides a healthy lather and deep clean while promoting scalp health for men. Removes product buildup, dirt, pollutants, chlorine, excess oils and other dulling residues from your hair and scalp while remaining..